Using barcodes with QuickBooks Point of Sale is the easiest way to track inventory and quickly ring up sales and get your customers through the checkout line efficiently. Two key components you'll need are the Honeywell 1300 VAD barcode scanner (wired) and the Zebra LP2824 USP barcode/label printer. Alternatively you can use a Wireless Barcode Scanner (Honeywell MS6235 Voyager BT). Intuit supports two different sizes of barcode labels. The small labels measure 1.2" x .85" and come with 1500/roll. The large labels measure 2.25" x 1.25" and come with 1135/roll. Below is an example of an item in your inventory. The Item No. is the QuickBooks Point of Sale generated barcode. Don't ever change this number. Just let QuickBooks do the work for you and sequentially number your items. This number is the SKU or barcode for this item. Alternatively, if your products come with UPC codes already on the item you can scan that UPC code directly into the UPC field shown below. I get asked many times which one should I use. My recommendation if that is an item already comes with a UPC code attached then use it. You can look up your items by the UPC code or the QuickBooks Point of Sale generated barcode. There is no problem using both. In fact, many of our client use both and still print the QuickBooks barcode and attach to the item. This adds an extra layer of security and inventory control. Also, if you're using only the UPC code your item may not have the correct price on the package that you're selling it for. 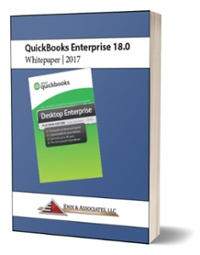 Printing the QuickBooks POS generated barcode solves this problem. The "I Want To" green button is your best friend. This button will always tell you what you can do in whatever screen you happen to be in at the time. In this case if I click this I have the option to print tags. As you can see in the 2nd window below, you can choose how many tags to print or you can print the "On Hand Quantities". This is used many times when setting up your beginning inventory at the opening of your store. You can also print "All - Print all items". BE CAREFUL with this option. You may print hundreds or even thousands of labels by mistake. In most cases, you will print the necessary labels at the time you enter your receiving voucher. Typically there is no reason to print the tags in advance until you have verified the quantities you want to tag and put out for sale. Below is an example of a printed barcode. You can see the description, the attributes, the price and most important the QuickBooks generated barcode (Item #) of #74. This is what will be scanned or keyed during the Make a Sale process. This barcode can be easily modified to have whatever information you deem necessary. To get this point you click on File>Tools>Print Designer. Choose the appropriate Document Type (in this case Inventory Tags).